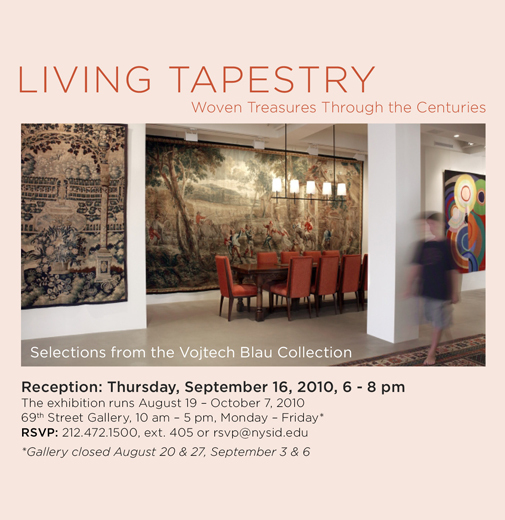 Vojtech Blau Inc. will exhibit rare and important works representing the history of tapestry design at the New York School of Interior Design, Living Tapestry; Woven Treasures through the Centuries, from August 19th through October 7, 2010 at the NYSID 69th Street Gallery, 161 East 69th Street in New York City. Simona Blau, owner and daughter of founder Vojtech Blau, has chosen a dozen mostly one-of-a-kind tapestries, many from her private collection, highlighting the art’s diversity and current relevance to interior design. These will include works dating from the early 16th to the mid-20th centuries. The exhibit will feature tapestries such as a rare and magnificent millefleurs; elegant courtly and mythological scenes; a spectacular Flemish harvest scene after Teniers; as well as a pivotal work by Jean Lurcat and bold and colorful works by renowned artists Sonia Delaunay and Alexander Calder. Living Tapestry: Woven Treasures through the Centuries is free and open to the public from Monday through Thursday 10 am to 5pm. For more information, please visit www.nysid.edu.